1. Mix all the ingrediens though not tomatoes and onions in a mixer or blend it. 2. Chop the tomatoes and onions to pieces and mix those together. 3. pour the Guacamole in a bowl and put the tomatoe salad, with onions on top of it. 4. If u add fresly pressed lemonjuice the guacamole can hold it's green colour for apx. 5-7 days in the fridge. Vitamins and Minerals: A,B,C,D,E, Kalium, Calcium, Iron, Zink, Germanium. Is rich on Vitamin D.
Vitamin D is important for our heart and nerves to function. Mix the meat with the Sour Cream and Corn and Chives. And it's ready to be served on a toasted bread or anything u wanna eat with it. If u want it to be FATTY u can u Mayonaise instead of Sour Cream - But it won't be good for your HEALTH AND UR BODY. Boil the eggs and cut 'em up. Steam and blend the broccoly - then mix it with the sour cream when it's cold. Finaly mix. the broccoly-cream with the eggs and u have ur salad ready for toasts etc. Info: If u boil the broccoly instead of steam it - it will loose every vitamins and minerals that it normaly has. This dish have gotten 5 stars out of 5 by Jerry, Susie and Perry from Knox, Indiana. 2 lbs of turkey-breast or Chicken without skin. - This u need to dry-fry on a fryingpan and add salt/ pepper and/or paprika/curry/chilli or what ever u want the meat to taste of. Apx. one third of a gallon, milk. - This u boil in a pot and add flour, stir in it until it gets thicker like gravy or sauce. Apx. 1 lb of Pasta-skrews. - Boil these until they are "al dente". Put the meat and the milk in a deep pan that can go into the oven. Put the pasta on top of it, so it covers all the milk. Finaly take some white bread and crumble it over the pasta so it covers the pasta. Set the oven at 400 degrees Fahrenheit / apx. 150-200 degrees Celcius. When the oven has reach its temperature set the pan in the oven in 15-20 min. The dish is done when the breadcrumps are brown. This salad is great to put in a glassbowl if u have guests. This salad has not been rated by amaricans yet. FETA - it's made of small cubes and is a greek cheese. Finaly u'll need Green olives with red peppers in 'em. Dressing: two thirds of Red wine vinegar and one third of Oliveoil + Salt and pepper. Slice the oniens and tomatoes in boats, Cucumbers in sticks, mushrooms in slices and red peppers in sticks. Put the oniens in the bottom of the bowl. Then take the tomatoes on top of the onions so they cover the onions. Now the cucumber-sticks over the tomatoes. The red peppers over the Mushrooms. Make the dressing and pour it over the salad. Put the salad in the fridge for at least 4 hours. The longer the salad stays in the fridge the better, though max. 12 hours. Put the greek FETA over the salad as crumps so it covers the salad and put the olives on top of it. The salad is then served. If served in a glass bowl u and ur guests will be able to see the colors of this salad from the bottom: White (Onions), Red (Tomatoes), Green (Cucumber), White (Mushrooms), Red (Peppers) and on top: White (FETA), Red and Green (Green olives with Red peppers). This is an almost fatfree and delicious shrimp salad. This salad has not been rated yet, by amaricans yet. apx. 1 third of a pound shrimps or crap meat. Slice the honey dew in 2 halfs and remove the beads inside. 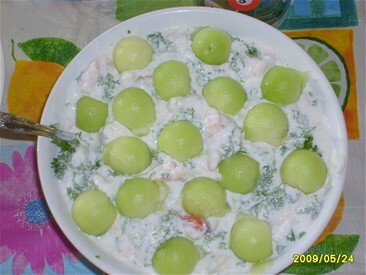 Mix the sour cream with the shrimps/ crap meat and put the juice of a half or whole lime fruit, into the salad. Put the mixed salad in each of the halfs of the melon. Take a table spoon and begin to eat. This is how the dish looks like if u serve it, and carve the honey dew out in pieces and lay'em on top of the shrimp/crap-salad. 1. Melt the butter, choclate and half the sugar over at hottop. 2. Let it cool down until it's fingerwarm. 4. Whip the yellow of the eggs with the choclate one at a time. 5. Whip the whites with the rest of the sugar until it's stiff. 7. Take a form and cream it with butter, then put sugar over it so the sugar cover all the sides and the buttom of the form. 8. Stir the whipped whites in the choclate over 3 times. 9. Put 2 thirds of the choclate in the form and set the last third in the fridge. 10. bake the cake for 30-40 min. in the oven. 11. When the choclate in the fridge hit's 5 degrees Celcius (40 degrees Fahrenheit) pour it over the cake. Vitamin B2 is good for the eyes.